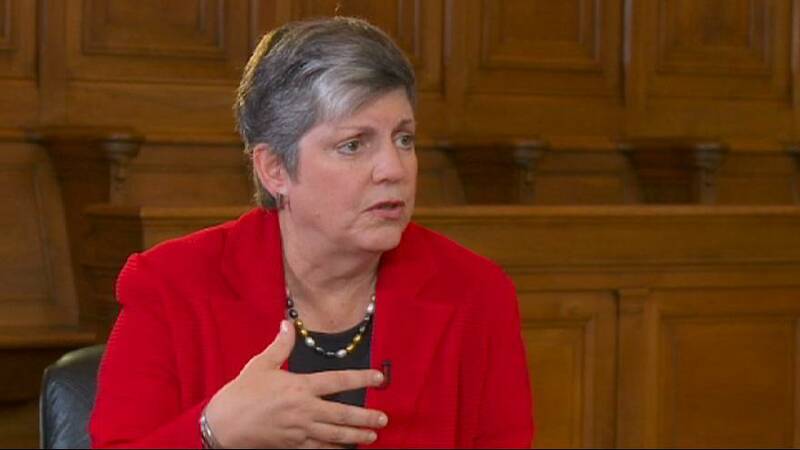 With the United States under constant threat of attack, not many people have a job as challenging as Janet Napolitano, the Homeland Security Secretary. In this exclusive interview conducted during her official trip to Europe, we asked her about the close cooperation with European allies, and the safety of America. She told us why the 9/11 attacks would be almost impossible today. Madame Secretary, you’re here in Europe talking to your European partners about a range of security issues. But I’d like to turn your attention first to a political issue, if I may. In the forthcoming election Mitt Romney has said he will increase spending on defence and other issues, whereas the president says he will cut it massively – he’s committed to cutting it. Wouldn’t America be safer under Mitt Romney? I think security really needs to be a non-partisan issue – what is required to keep a country safe and to sustain that capability, and that is not just defence spending but also law enforcement and other types of security spending as well. So, that’s what we’re focused on and one of the nice things about my position has been that the committee that oversees it in the US Senate (the Department of Homeland Security) is run on a fairly bi-partisan basis and it’s really focused on: What is the best organisation and how do we do this in the best way? How do we deal with changing and evolving threats? Most of Washington’s leadership believes they will reach such an agreement. But if they don’t, and we have across the board cuts, then it will mean for us fewer screeners at airports, which means lines will be longer, means fewer port inspectors, which means lines will be longer, fewer border patrol officers – those are agents that police between border stations. So it will have an impact on our current efforts vis-a-vis security. Up to now how have you found the cooperation, the cohesion within Europe in terms of sharing information with the United States? We’ve had good cooperation with Europe and good cooperation with France. Really, what we’re talking about is how we make that cooperation even more robust while recognising that there’s a need to protect privacy rights and civil liberties at the same time. We just reached an agreement with the European Union to share advanced passenger information about airline passengers under certain circumstances. The information is always shared but it is very protected so it doesn’t become public. It is used for the purposes for which it is given. Those are the kinds of things when we say information-sharing, that make our operators more effective, make our screeners more effective and ultimately make people safer. Do you sometimes wish that you had more cohesion within the European states, because, you know, it’s 27 different countries, they’ve got different policies. Would you like to see Europe advance to a common defence and security position where they could be more [like] one single partner for the US to deal with? Well, I think, you know, as we’ve gone on – and I’ve been the Secretary for almost four years now – I’ve seen movement in that regard, and I think it will take its natural course, but we deal with 50 different states of the United States, all of which have somewhat different rules and protocols and procedures and the like, so one of the things that we have to be able to do is be flexible. The Department of Homeland Security was set up in the aftermath of 9/11, of course. How has its progress grown? How is the information-sharing going between the different security agencies in the US? Are you satisfied that it is where it should be? Well, we’re never satisfied, because we’re never done. The threats continue to evolve, we continue to deploy new and innovative technologies in order for us to better assemble and analyse data, but in terms of information-sharing within the department it’s so much better now than it was five years ago, and five years ago it was better than it was when the Department was started ten years ago. There was almost a culture of rivalry between certain security agencies at the time of 9/11. That has been eradicated – you’re confident… Would you say you’re confident that 9/11 couldn’t happen again for those reasons? I’m very confident about that. I think the events that led to 9/11 with the current procedures and practices that we have in place now – not just within DHS (Department of Homeland Security) but with the FBI and others. It would be virtually impossible to have a replication of 9/11. That’s not to say we couldn’t have another style or another type of attack, which is what I mean when I say we can’t ever rest and say we’re finished. Once we say that, our adversaries will find some other means of attack. What’s your big concern? In terms of foreign or domestic terrorism what keeps you awake at night? I would say two areas have deserved our sustained attention. One is aviation – we had the episode of trying to put a cargo bomb on a plane out of Yemen. There’ve been other attempts to try to blow up an aircraft, either by a passenger or by cargo. So aviation and then cyber. The different styles and the sheer numerocity of attacks occurring via cyber now… It’s the fastest-growing area that we’re dealing with. How could a cyber crime affect the US? What sort of potential effect could it have? There are many different styles, from what they call a D-DOS, Distributed Denial of Service Attack, which interferes, say, with the financial system or something of that sort, to a control system type of takeover where you actually try to take over the control system, say, of an electric utility, to major theft and theft of intellectual property or secret information, to child exploitation via the Internet. Are those the kind of concerns – and I’ve read this – that [have led you not to] use email any more, is that true? Well, that is accurate. I don’t use it in part because of personal preference and in part because I’ve got everyone around me who uses it. But if I were to use it I would want to make sure I was practising very good cyber hygiene. So we can get by without it, that’s your own personal message? You can get by without it and be quite happy, but it helps when you have a great staff, which is what I’m pleased to have. Let me ask you about Iran, the situation with the nuclear facilities. Israel has talked about, suggested, a pre-emptive strike. Iran in response has talked about attacking US interests at home and abroad. How do you counter a threat like that? I think that one of things that we are all experiencing is the different types and number of attacks that come from a variety of sources, some of which may be state-sponsored, some of which may not be, attribution often is a question. We deal with those on an episode-by-episode basis, but our number one mechanism to do that is to quickly identify, share information and put in blocking or other mitigation effects. President Obama famously held out the hand of friendship [to Iran] in his inauguration speech in 2008. Will that attitude of openness exist in the next inauguration speech if he is re-elected, do you think? I ask you as a Democrat. And as a US citizen… [my response is…] Look, I don’t play ‘what ifs’ but I can say that efforts by Iran or other countries to become… possess nuclear weapons… shouldn’t be countenanced by any country of the world.